Ni63. Red, 50% opaque. Taste had high-toned notes, perhaps a shade of mint, and red fruit. DRT rightly observed stewed fruits. Dark red. Thick, viscous entry with dense black fruit. Perhaps a little stewed. Finish shorter than expected. I recall commenting that this was "odd", but I did enjoy drinking it. I expected the Port to be that way. 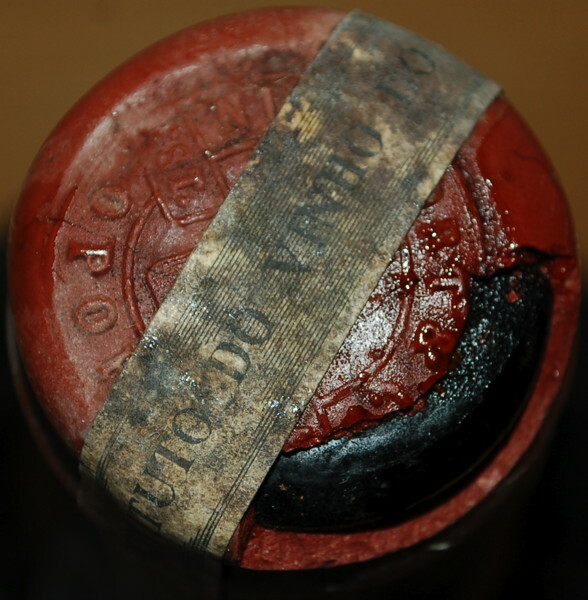 For whatever reason 1963 is a Vintage where Niepoort does not live up to their normal - very high - standards. I never really understood this Port. I noted very dark red colour. Elegant and fresh bouquet with malty and coffee notes, some chocolate in the background. Slightly dry on the palate, very fruity, but somewhat de-structured. Aftertaste was medium long. Just by expectations you would demand much more from the year/producer-combination. A glorious glass, so good yet so different to the Taylor behind it. Pure elegance. Firm red in colour; 50% opaque. Sharp, sour fruit on the nose, full of dust. Sweet and thick in texture; sweet fruit and a mass of dusty tannins that grows and delivers nuance and layer of flavour. Large and powerful on the palate. Balanced aftertaste and an amazingly long finish of bitter chocolate that slowly changes to a maraschino cherry. Very fine, very good. 91/100. Drunk 11-Oct-13. Decanted 3½ hours.